Pension annuity rates surge ahead up almost 4% on average from providers as gilt yields rise for the second month in a row before falling back to end the month unchanged. For the second month in 2018 providers have increased pension annuity rates up almost 4% on average following strong rise in the 15-year gilt yields of 25 basis points since the start of the year when they were at 1.50%. During February yields increased further to 1.89% as strong inflation data in the US suggested the Federal Reserve would deliver more interest rate rises than the market expected. The Federal Reserve are expected to sell $1 trillion of bonds and analysts have suggested higher yields are required to bring investors back to the bond market. 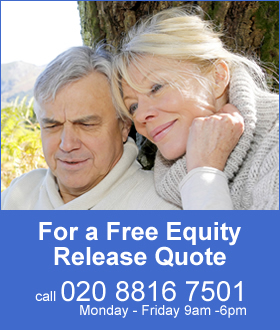 People in the UK are benefiting from the higher yields with virtually all standard annuities up by 3.81% on average with all smoker and enhanced annuities higher by 2.60% on average. Providers have increased annuities in February even though the 15-year gilt yields have fallen back to 1.75% to remain unchanged. The table above shows how gilt yields have improved from 1.34% in September 2017 to 1.75% in February 2018. Our benchmark example has reached another two year high (see table and chart below) which is based on a 65 year old buying a single life, level annuity with a fund of £100,000. This has increased since the all time low reached in August 2016 of £4,696 pa rising 20.2% or £949 pa to to the current level of £5,645 pa. The highest previous level was £5,823 pa in November 2015. 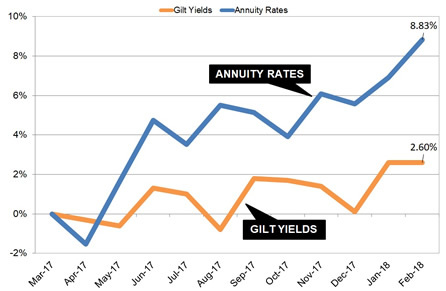 The chart below shows that providers have maintained annuities at a higher level than 15-year gilt yield since March last year and recent expectation of higher interest rates and rising yields has seen providers increase annuity rates aggressively. Over the last year standard annuity rates have increased on average by 8.83% compared to 15-year gilt yields rising 26 basis points. In the last month for some annuity features the rise was even almost as high as the average over the year with 50% joint life with 3% escalation for those aged 75 up 7.80% for February. For single life for those aged 75 rates are higher with 3% escalation by 6.03% and level by 5.55%. For those aged 55 on a single life and level basis rates are up 5.17% with other strong improvements across the board. For our benchmark example income has increased by £949 pa since August 2016. In terms of lifetime income, the Office of National Statistics (ONS) would expect a male to live for 17.3 years and he will have £16,417 less over his lifetime. For a female she can expected to live for 20.4 years decreasing her lifetime income by £19,359. For those taking their annuity now will obviously benefit from these strong gains in rates as providers expect higher interest rates and further rise in gilt yields in the medium to long term.